Lindsay Lohan has been building a photo album with the police. It is not the kind of photo album most people would want. It is a collection of mugshots. As of this week Lindsay Lohan has six in her collection. It all began July 24th, 2007 and has not stopped. The crimes are not always the same and neither are the mug shots. In the photos you can see that during the past 6 years years not only has Lindsay changed her hair color but she has changed her face with a lot of plastic surgery. Her latest mugshot (photo at top) was taken Tuesday when she was formally booked after pleading no contest. Lindsay was sentenced to 90 days in a lockdown rehab facility, 30 days of community labor, 18 months of psychological counseling and some minor fines. The judge told Lindsay she better behave herself but it looks like that fell on deaf ears. Right after her sentencing rumor has it she was hitting the party scene already. Check out the mugshots above and vote in our poll and let us know which mugshot you like the best, I am voting for the current! 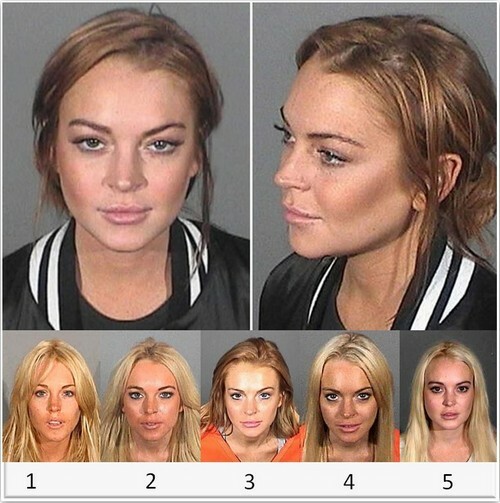 Which Is Your Favorite Lindsay Lohan Mugshot?